Everybody sheds. But cats and dogs do it a bit more than humans do. Trying to keep an apartment completely clear of pet hair all the time is a losing battle, but there are certainly a few ways to make cleaning up Fluffy’s hair a little easier. 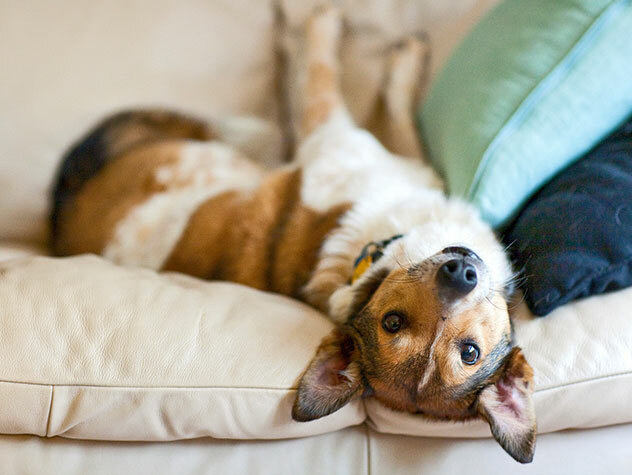 Some of the most effective life hacks for cleaning up pet hair include a couple of tools you may already have around the apartment: rubber gloves and a squeegee. Try putting on a pair of damp rubber gloves and running them over your furniture. You’ll notice they instantly pick up almost every last hair on the surface. Or, if you have carpeting, drag a squeegee across it (like the kind you’d use to clean a glass shower door). It will grab much more fur than a vacuum alone. If your pets are getting into trouble when you’re gone, provide them with some stimulating entertainment to keep them away from other fun things … like your shoes. For dogs, crate training and appropriate enrichment toys (such as a Kong) can help. For cats, create a DIY scratching post by gluing cardboard, rope or rubber onto a plank of wood. You can also make a kitty puzzle by putting treats and toys into a plastic container and cutting holes in the lid. They’ll love trying to get everything out through the holes. If you’re trying to keep your kitty off the counter to no avail, there are a few hacks you can try. One option is to create a place in the kitchen that IS alright for her to go. To do this, provide some alternative, higher-up places that are appropriate for your cat such as a cat tree, or some shelving on the walls. Be sure to make the chosen area attractive by rubbing catnip on it, feeding or petting your cat while she’s there. If needed, you can also make the counter less attractive by placing some tin foil on top of it. Keeping pet food in a small apartment can sometimes be tricky—especially if you don’t have a lot of storage space. Instead of keeping the big bags of food you buy at the store, try emptying the food into large plastic bins or pitchers. Keep these in a drawer or cabinet in your kitchen. That way, you’ll be able to hide the pet food from curious dogs and cats that may tear into the bags while you’re gone. There are a number of genius hacks for disguising Fluffy’s bathroom. One commonly used idea is to place it under an end table. Install decorative curtains around the table to keep the box out of sight. You can also easily make a pet door in some types of furniture (like the kind you’d buy at Ikea or Target). This will allow you to keep the litter box in, say, a set of cabinets but still give Fluffy access when she needs it. It’s as easy as cutting a hole in the cardboard backing of the furniture you buy! Just make sure you show Fluffy how to get in.